The Hunter 4 Seasons Dog Box with Top Storage is the ideal aluminum dog box for hunters who get in the field year round. 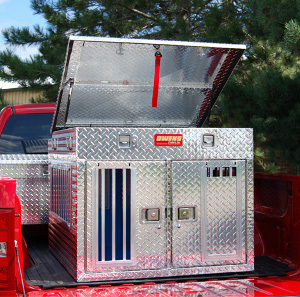 A few features that make this aluminum dog box so adaptable are the storm covers on the doors, the oversized side and rear vents (also with storm covers) as well as the lined compartments themselves. Hunters will appreciate the diamond tread on this aluminum dog box, as well as the top storage compartment for safekeeping of essential equipment. The Hunter 4 Seasons Dog Box with Top Storage is a little roomier than other dog boxes and is perfect for taller breeds.